Name your project and then click on OK. The following secondary dialog will appear. 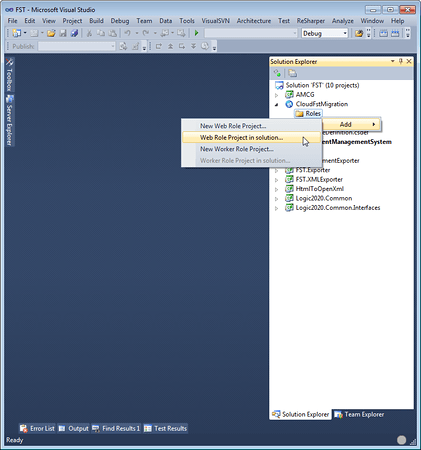 Since you want to use one of your existing web applications leave the “Cloud Service Solution:” section empty and click OK.
You will then see the following project appear in your Visual Studio 2010 Solution. 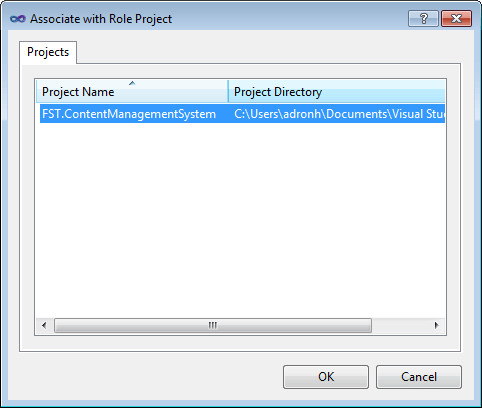 Right click on the Roles Folder in the new project as shown below. 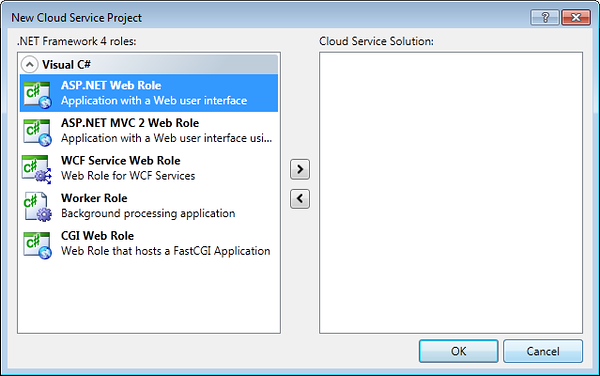 You will get the following options as shown; “New Web Role Project…”, “Web Role Project in solution…”, and “New Worker Role Project…” and select the “Web Role Project in solution…”. 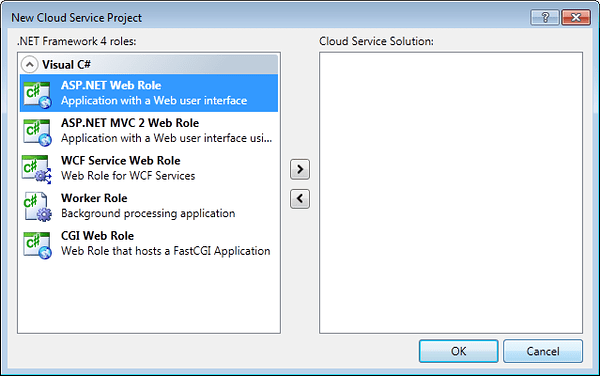 The following dialog will pop up with any available web applications, in my case there is a single ASP.NET Web Application that is listed. 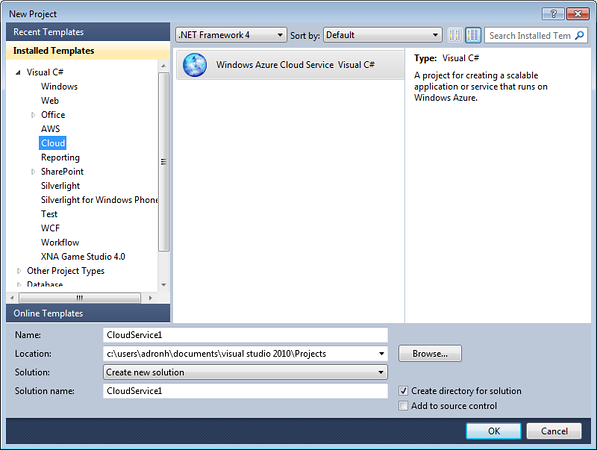 Click OK and you now of a Windows Azure Cloud Deployable Application. Complete a build and right click on the Cloud Deployment Project and click Publish for the next steps into the cloud. But I’ll leave that particular exercise’s steps for another entry. 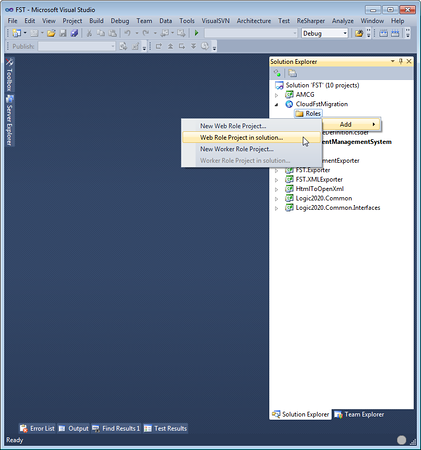 This entry was posted in Azure, Cloud Speak, How-to and tagged asp.net, azure, cloud, visual studio 2010, windows, windows azure on June 24, 2010 by Adron. This is a great post that push for azure migration and usage. but this isn’t enough mentioned information here for migration. You still need to include Windows Azure references to your website -specially runtime dll. Also the main important class to run smoothly “WebRole.cs” in order to be able to start your application and deploy it in the cloud. Hey Tariq, thx for commenting. I’ll have to update the entry to include the runtime bits. 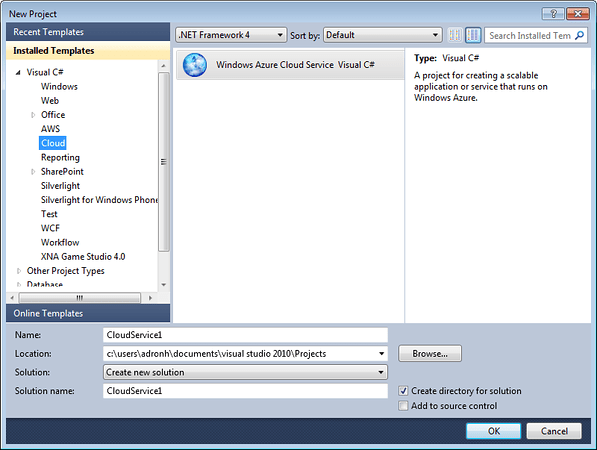 All you really need is the Windows Azure SDK to do this migration. I’m not sure however, about what you are looking for with the “WebRole.cs”.